Since we spend so much time in the office sitting in a chair, it’s important to make sure we are not doing anything to hurt ourselves. Long hours of sitting often results in back pain, neck and shoulder pain and knee pain. This has also led to a lot of research and innovation in the office chair category. We now have comfortable ergonomic office chairs, reclining chairs with footrests, gravity chairs, etc. A new addition to these is a balance ball chair. I am sure you have seen this before. A woman doing yoga poses sitting or balancing on a balance ball (remember?). This ball is large, almost like a beach ball, but unlike this, it is made from the very durable material. Because it’s made of strong material, you can sit and balance on this ball and also lift it to use in many types of routine. 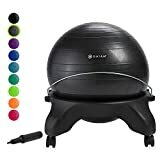 The same balance ball can be added to a small extension (that has a back support and legs) and it becomes a balance ball chair. This chair is basically a pedestal where the balance ball sits. Because the chair frame holds the ball in position, it won’t move. You can sit on the ball, practice your balance and develop your core even when you are not in the gym. What is a Balance Ball Chair? A ball chair or a balance ball chair is more of an equipment for fitness rather than a piece of furniture. It is a chair frame that is used to hold a balance ball. The ball conveniently sits in the frame of the chair and is held by some kind of brace. 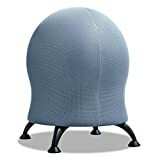 A ball chair has back support, however, most ball chairs in the market only have a small piece of plastic to support the back. Ball chairs may have wheels for feet or may have regular chair feet for stability. The balance ball can be removed from the chair. This means you can use the ball separately as a fitness tool. Most people who use a balance ball use it mainly for fitness but if you have finally mastered the use of this chair then you may opt to replace your regular office chair with this one. You may use this as you read, watch television, or just to relax. A ball chair has many benefits. It can be useful in maintaining and developing balance, it helps strengthen your core and will also improve posture in the long run. 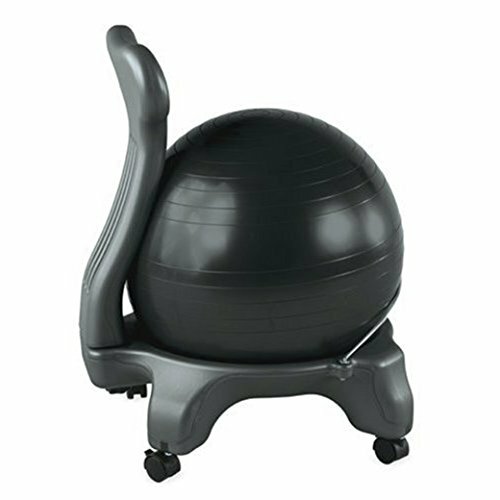 If you are used to using a balance ball to improve your balance then a balance ball chair makes it easier to use for you. You can sit on the ball chair and the chair frame will hold the ball for you, prevent it from moving and you from falling. Regular use will help you gain more control over your core, your back muscles, and your balance. As you develop your balance, you are also strengthening your core in the process. You will feel your abdominals getting tighter and firmer while your back, shoulders and neck muscles follow. Since the ball remains in a seat frame, you can sit on it for long hours and you can use the balance ball at home, at work, at the gym or anywhere you wish to train. Strengthening and developing your core leads to improved posture. The ball will gradually lead you to the ideal seated posture which you will be able to adapt as you stand, walk and move. You will be able to straighten your back, move your shoulders back and keep your legs and feet in a comfortable position when you use a balance chair. 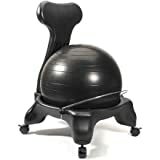 If you have any back or spine conditions, consult your doctor or physical therapist before using a balance ball chair. Sitting on a balance ball is one of the many ways you can relax in yoga. Sit on a balance ball chair and keep your bare feet planted to the ground. Let positive energy fill you as you close your eyes and take a deep breath. Hold for a few minutes and then exhale using pursed lips. Relax and just let every worry float away. As you get the hang of using a balance ball chair, you will eventually find it fun. It is fun to use as you sit on this chair at work. You move it from side to side, front and back easily because of its smooth caster wheels. In this article, I have reviewed the 10 best balance ball chair that you can find in the market and buy online. I have included all the important details for each balance ball chair to help you make a decision. 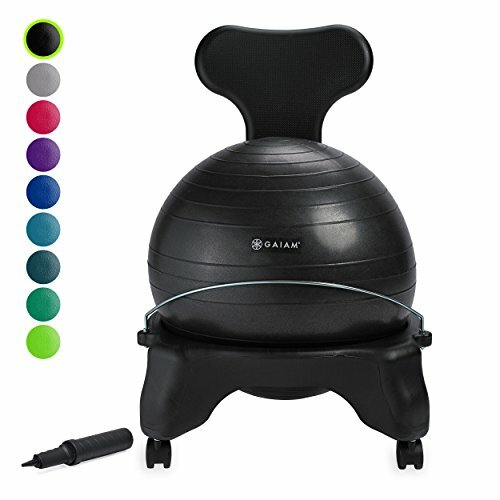 In case you’re in a hurry, here are my top three recommendations for the best balance ball chair. Still confused about which balance ball chair is best for you? Let me help by providing detailed reviews on the balance ball chairs that I found in the market (and the ones you can buy online). These reviews will definitely help you gain awareness and understanding about the best features, pros, and cons of each balance ball chair. Below is the table that shows all the balance ball chairs covered in this review followed by the detailed reviews of each of the balance ball chair. Find the one you need by checking out the product’s pros and cons. Below are detailed reviews of each of the balance ball chair covered in this article. 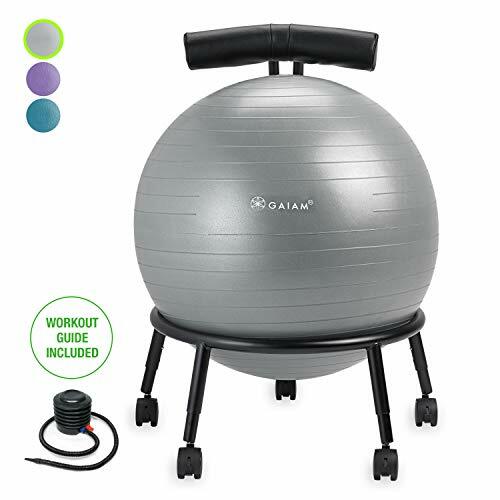 The Gaiam Classic Balance Ball Chair can be used at home or at the office. This could be your alternative desk chair which can improve overall well-being and will make office work fun. This is known to improve posture and core strength and will also boost energy levels. It has a removable balance ball similar to a yoga ball. You will be alert, efficient and engaged when you sit here as you work on your tasks and projects. You can use this to work on standard-height desks. It has a 300- pound weight capacity and has an adjustable metal support bar, lockable easy-glide casters, an air pump, and an exercise guide. Get an office chair or a recreational chair and a fitness ball in one with the LuxFit Ball Chair. You can use this at home to replace your usual TV chair or use it at the office as a desk chair. The balance ball is more than a regular exercise ball. It is a static strength ball that will never tear or leak even if you use this daily. Experts agree that the LuxFit Ball Chair is effective in improving spine and back health. It can also reduce rehabilitation time and may also prevent spine conditions. This is your alternative, custom-fit office chair that will help you engage your core throughout the day. You can easily adjust this to fit your specific size and height. It has the same Gaiam yoga ball that is very durable and firm. It will keep your core healthy, will align your spine and reduce back pain and stiffness. This ball chair will also boost your energy levels and increase productivity. This ball chair has adjustable legs that will allow you to adjust the chair height accordingly. It can take up to 300 pounds of weight. You can also stay safe with its five lockable caster feet. It comes with a three 20-minute workout plan and three 10- minute express routines to keep you on your feet. If you are already a pro at balancing with a balance ball chair then your next step is to prove your worth with a Gaiam Classic Backless Balance Ball Chair. 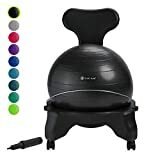 This is a stability yoga ball chair ideal for home or office use. Available in different colors, this chair can be used to build a healthier core, to align the spine and to reduce stiffness, back pain and improve energy levels. The yoga ball comes with an air pump so you can reflate the ball as needed. It has an adjustable metal support bar and easy-glide casters that are completely lockable. You need to re-inflate this ball chair as needed as you perfect your routines. This low-profile ball is ideal for active seating and will enhance your living room or office design as well. The Safco Products Zenergy Ball Chair is available in different colors. It will keep your body moving with an active seating experience. It is stable and durable and offers the many benefits of a yoga ball but is safer and more durable. It has a low profile design and weighs only 15 pounds. You can move this from place to place and will never burst open. It can carry weights up to 250 pounds. This is GREENGUARD Certified which means it has met rigorous, third-party chemical emission standards. The cover of this ball is made of polyester mesh fabric. Similar to the previous item, this low-profile ball chair is perfect for active seating. This will improve your living room or office design. The Safco Products Zenergy Ball Chair comes in a variety of colors. It will keep your body moving using active seating experience. 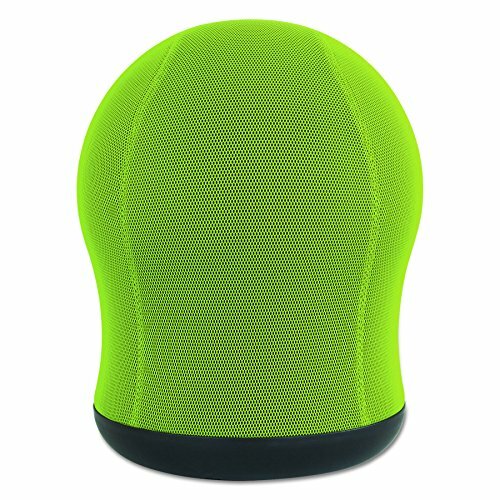 It durable and offers the many benefits of a yoga ball but is safer and definitely durable. This has a low profile design so you can easily pair it with your interior décor. It can carry weights up to 250 pounds. This is GREENGUARD Certified which means it has met rigorous, third-party chemical emission standards. Light up your room with this cute low-profile ball chair. This cute green chair is ideal for active seating. This will enhance your living room or office design because of its minimalistic and modern design. The Safco Products Zenergy Ball Chair will keep your body moving using active seating experience. It durable and has many benefits of a yoga ball. But unlike a traditional balance ball chair, this seat is safer and definitely durable. This has a low profile design so you, therefore, it is perfect for any kind of decor. It can accommodate up to 250 pounds. This is GREENGUARD Certified which means it has met rigorous, third-party chemical emission standards. This is safe to use indoors with no dangerous emissions whatsoever. 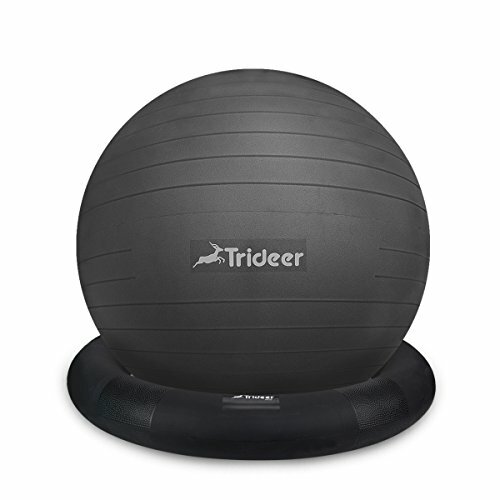 The Trideer Ball Chair is unlike your traditional ball chair because it is simply a stability yoga ball with a base. This is ideal for home or office use and for beginners because it will keep the ball steady as you sit. It will help you improve your balance, reduce back pain, improve core strength and enhance good posture. The Trideer Ball Chair is available in a variety of colors. The ball has anti-burst features and is durable. This is not like other ball balance chairs in the market. 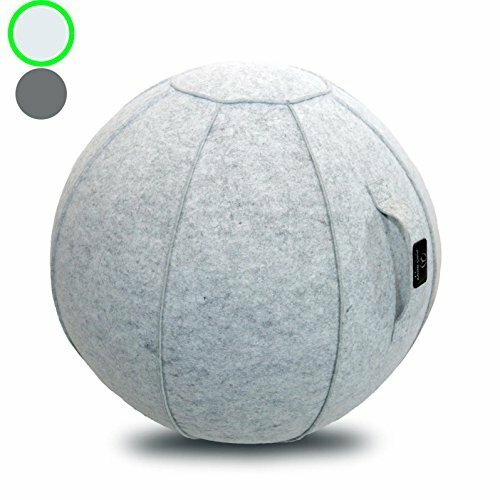 You will be surprised that it does not have a backrest or an armrest but it is only a ball with a handle. It has a clean and attractive design that you will find perfect to use for any kind of interior. You can use this to engage your abs and core muscles as you sit. You can upgrade this to an active sitting area and a healthier lifestyle. Your purchase comes with a cover, inner inflatable ball, spare plugs, and inflation pump and inflation instructions. Replace your old office chair with the JFIT j/fit Stability Ball Chair. This chair has a removable balance ball for comfortable ergonomics. It uses the same principle as a workout routine with a balance ball. You will be able to develop a healthier back, reduce pain, improve your overall well-being. You can use this with or without back support. 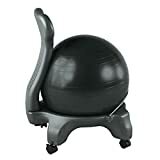 Some balance ball chairs come with a removable ball while some only have a half-ball design wherein the so-called “ball” is simply a rubber cushion with air. Choose the chair with the removable ball so you can use the ball for other exercise routines. Use a chair with better back support. The most you will find only has a very small back support which may hardly fit your back if you are a large-framed person. A larger back support will also help you balance especially when you are new to using this type of equipment. You must choose a balance ball chair with suitable armrests. Just like a good back support, the armrests will help you hold on to the chair as you sit and as you dismount. This is a very important safety feature for first-time ball chair users. Insist on a balance ball chair with lockable caster feet. You really need this if you are new to using a ball chair. And if you are still working on your balance, it would be best if you were to use a ball chair with ordinary feet rather than casters for feet. The type of material is very important. The most common material used is plastic on the chair frame, back support and armrests while there is a metal brace to keep the ball in place. The balance ball is usually made from rubber but insists on the hard rubber to avoid tearing and leaking. As much as possible, check reviews, ask people who have used a balance chair before. Find reliable suppliers to get the most out of your money’s worth. A balance ball chair is a fitness furniture/device that you can use at home, at the gym or at the office. 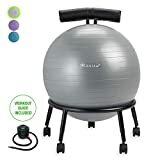 It is basically a fitness ball seated on a base. There are many designs of a balance ball chair so shop smart and be sure to find the ideal one that will work for your needs.